If you ever need a little getaway, to escape the city and go on a waterslide and lounge at the pool, Pines Resort is the place for you. It is a great little hidden gem about 45minutes out of Johannesburg. It is a quick drive to complete peace and ofcourse Summer Vacay Vibes! Not too many people know about this place so you’re bound to have a great time that is not overly crowded with fake-holiday makers. 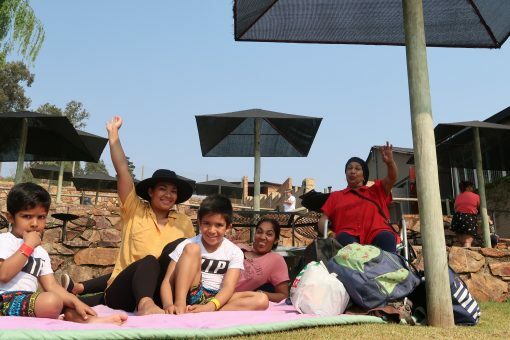 We had an absolute blast when my family and I decided to go for the day. I think my short little vlog will share my experience a lot better than me trying to explain how much fun we had. So please do watch it HERE. Being Muslim, it becomes a little bit more difficult to find places that will accommodate our dietary requirements. It’s great that more people are catering to vegetarian and even vegan options, but NewsCafe has gone above and beyond for my mom and I, when we decided to head over to Midrand for a quick breakfast. From the very convenient little green “V” alongside all their vegetarian options, on the menu, to the friendly, accommodating staff, we managed to have a delicious meal. I also thought that the Newscafe brand was more catered to snacks and meals that you normally have later in the day. We were pretty impressed by the large variety of breakfast options. I have never really been much of a #Foodie but I certainly must say, maybe I ought to be one. The food came in no time at all and to be honest, I chose items that I thought would be pleasing to the eye, so I can get a good pic… because Hey! 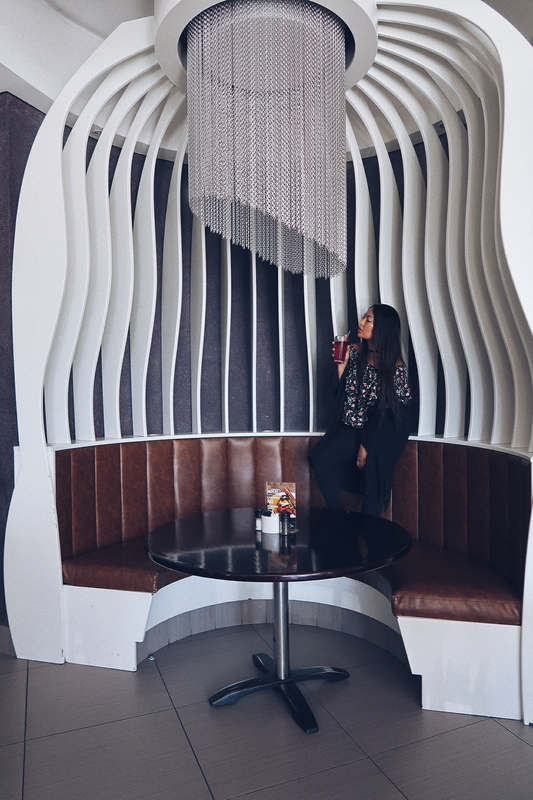 It’s not everyday I get to review a quirky, cool restaurants! The food was as pretty as promised and it tasted as pretty as it looked! For once! Don’t you hate it when you crave for something really badly, and you finally get it, but it doesn’t quite hit the spot? Maybe it’s because I didn’t really know what to expect or maybe I was really hungry but the food was GOOD. The Midrand branch really has a vibe, there were a few middle-aged people having a very chilled morning sipping on aesthetically pleasing drinks and I have a new found likeliness to large black coffee mugs. The prices were also not bad, especially considering the portion sizes and they also offered us a complimentary bowl of salad and may I just add that they use the BEST feta cheese there is! My mom and I ended up picking out all the Feta… which is exactly the reason I should probably not become a serious Foodie! Nothing beats a vacation away from the hustle and bustle of the city life for a little while, even if it’s just for the weekend. The Capital on The Park is the perfect getaway because it’s only 30 minutes away. We left work a little earlier on Friday and it took no time at all, to get there. 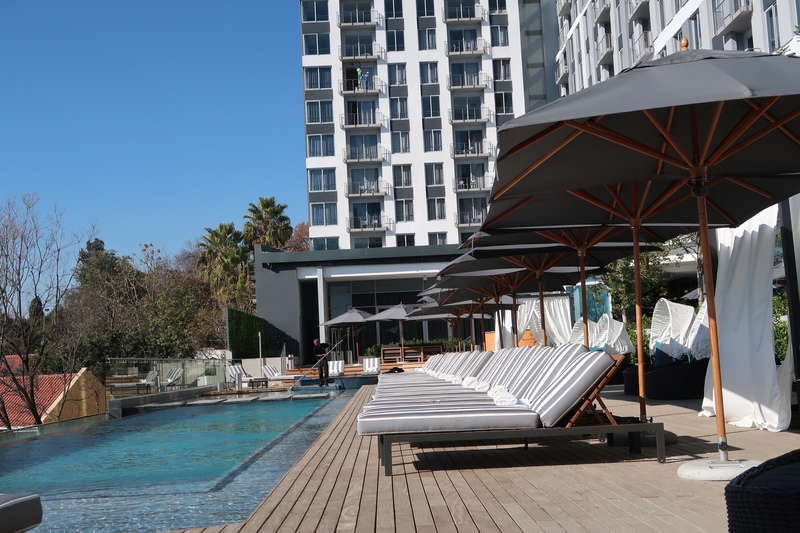 It is located in the Hub of Sandton City and it is perfect for a quick stayover or a more long-term stay as well. They offer hotel rooms or self-catering apartments and I was fortunate enough to stay in one of the apartments during my staycation to review this brand new property. The extremely modern architecture and really cool artwork and art pieces all over the property is definitely something to look at. I really love the thought behind the structure of the property and the detail that went into creating something so aesthetically pleasing. There is a gorgeous infinity pool and Jacuzzi that is overlooking the incredible landscape and at night there are dreamy lights making the pool water look like pure magic! If it wasn’t winter, I think we would have to fight for our spot on the sun deck. Spoiler alert! I didn’t. There was just too much exploring to still do. There was a mixer at the hotel the evening and Nadia (my sister) and I decided we needed to check out the indoor gym and grab something to eat while at the restaurant. We ordered a tuna sandwich and vegetarian friendly grilled cheese sandwiches. We bumped into a friend, who was also staying over and ended up enjoying our dinner together. Before we went back up to our apartments, we had some cappuccinos and I must say, their portion sizes are really decent, and the pricing is not too bad at all. When ordering toasted sandwiches from non-halaal places it is always a great idea to ask them to wrap the entire sandwich in foil before placing it on the grill, to avoid any food contamination. Also to make sure they do not fry any meat products with their chips so you know your chips are ‘clean’. They say that breakfast is the most important meal of the day, and because we are basically forced to consume something every morning, we kind of run out of options… but The Capital on the Park has got you spoilt for choice! From the usual favourite cereals and a huge selection of warm options to fancy bakes and fresh fruit. This array is fit for any tummy orders you could possibly have. After putting on some serious calories, the indoor gym comes in pretty handy. They even offer yoga during the week to those who would like to start the day off with some guided movements. The gym is right next to the dining area which I am suddenly thinking, could be some not-so-subtle hinting going on?! But either way, very clever! So let’s say you want to hit the gym before breakfast with the family, but not sure what to do with the kids during that time? Well there is a special entertainment area there for them. There are quite a few options but one thing that stands out for the teeny bobbers is a virtual golfing game. They also have some family-favourite board games that you can play. 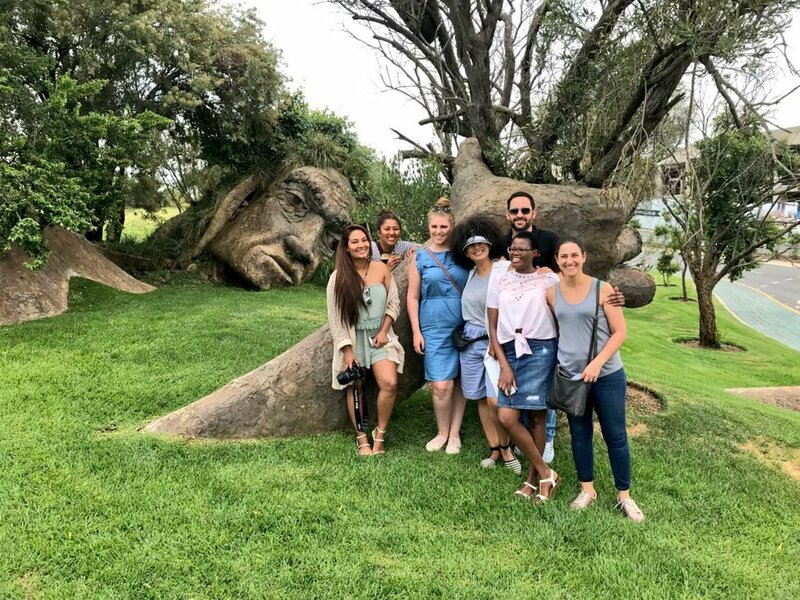 The hotel also offers a very convenient shuttle service that takes their guests to and from some of the cool places around the hotel, including Nelson Mandela Square and the Guatrain, which is super convenient. The Capital on the Park is perfect for a little getaway that won’t break the bank but will get you feeling super relaxed and energised for the busy week that lies ahead. Here is a little vlog from my time at the hotel and some of the interesting things we got up to while we were in Sandton. Nadia and I also ended up going to Nelson Mandela Square to try out the shuttle service, we grabbed some lunch, done some shopping and headed back to the hotel when we were ready. We ordered in some room service and watched some movies before bed and before we knew it, our little staycation was over! Please do check out the amazing Capital on the Park website, pricing etc, click HERE. If you would like to watch my follow-me-around Vlog, click HERE. Ever since I heard about the Coachella Music Festival, I’ve always wanted to go! The appeal of the festival is insane and with most hyped up experiences, sometimes that is all it is… a hype! People from all around the world hone in on the insane line-up and the serious FOMO after not attending yet another year! The #OOTD posts across millions of festival-goers’ social pages are enough to send you into a whirlwind of FOMO that could have you mourning all year! The fact that the hottest acts of the year perform to millions of people on monstrous stages where artists like Lady Gaga, Beyoncé and The Weekend perform, our very own Black Coffee and Goldfish performed this year and may I just say Well Freaking Done! That’s major! Celebrities like Vanessa Hudgens, Justin Bieber, Kardashian/Jenner clan and every socialite around the world are flying across the world to attend. Everyone is basically chilling at the grounds with fans and other celebrities all there showing off their festival-type outfits, hair and makeup; everyone eager to take bomb photos for social media and well enjoy the music sensations tearing up the stage! Half the people are apparently not even truly there for the music but more for the experience and the slight chance they might bump into one of their idols. I mean I certainly wouldn’t pass up an opportunity like that! Watching the many Coachella vlogs on YouTube, it has become apparent that there is a lot more than what meets the eye. But I guess that is with everything the media hypes us up to believe. What you don’t know is that it is still separated in the general access, VIP, VVIP and so forth and everyone is hoping for a step up from whatever pass they have. When you see your celebrity icons, it’s like a quick OMG and then you walk on, if you’re lucky you could maybe score a quick selfie and that’s of course if you’re in VVIP and get invited to the super exclusive festivals that happen at other locations in the dessert and at the actual festival. Most of the celebrities make candid appearances, listen to some of the performers and before you can even ask for a selfie, they’re already gone. I’ve heard that apart from a ton of disappointment about the hype not being what it’s promised to be, it is also extremely expensive! and I’m not talking about R200 for a coffee… I’m talking like a normal-persons-life’s-savings kind of expensive! Firstly, you must travel to the actual dessert of Empire Polo Club in Indio, California! For South Africans, you’re going to need a Passport, VISA, plane ticket to California, shuttle services and a few Ubers, accommodation, food and drinks. And that excludes the cost for your bomb outfits and your normal “vacation” expenses. Then when you get there, you must buy food and drinks and whatever passes you’ll need at the festival. There is a whole situation with the Uber drivers and the safety aspect of sitting outside the festival for hours waiting to go home. There are thousands of people in attendance and the lines to EVERYTHING is quite possibly the longest ques you’d ever find yourself in, starting from the traffic just getting there initially. 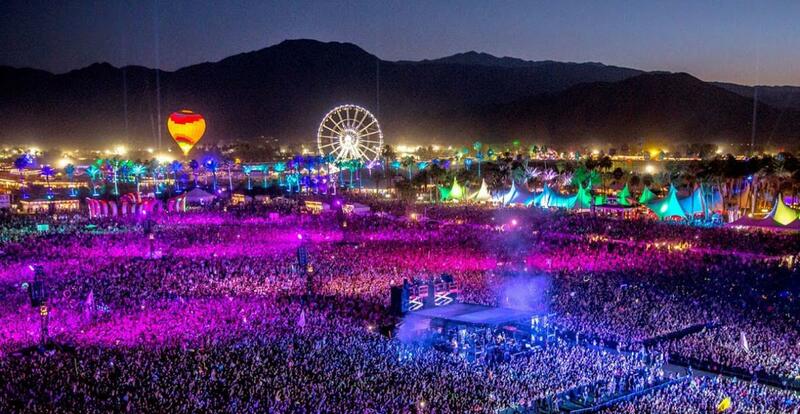 With all that said, I still want to hit up at least one Coachella Festival before I’m too old that it’s just creepy. But if you think about it, it is probably just under R100K for a day of two. It’s absolute madness! How do I still get Coachella FOMO every year?? I think I might be crazy! What are your thoughts? By now I hope that you have all watched my vlog touring Steyn City. If not, please do and leave me some comments, about what you think. I don’t know about you guys, but I love new experiences. Seeing new places, trying new things and having the opportunity of finding a new perspective on life. Attending these blogging events is like having an exclusive opportunity to experience a different side of a place, a product or just the experience, in itself. I feel very blessed, because it’s not just about getting a bunch of free stuff, it is about having my readers live vicariously through me. 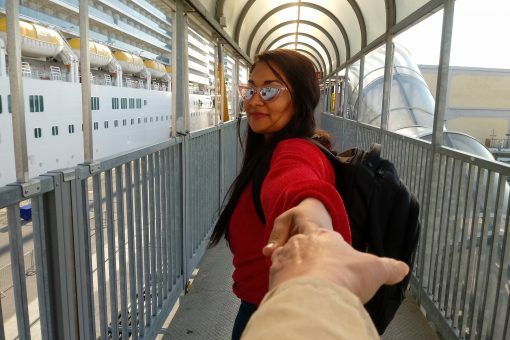 I love having the ability to take you on a journey with me, even though we are miles apart. I am also getting into the vlogging game and trying my best to get you guys a front row seat to any of the amazing things I get up to. Steyn City is a city on its own. From normal golf estates, it is expected that there would be a club house, a pro shop, maybe a salon, but to have a top line equestrian centre and school, beautiful oasis to outdoor training facilities, just to name a few of the incredible offers. The vision of Steyn City is actually unfathomable, somebody sat there thinking about every little detail and how to make it a futuristic reality. From beautiful apartments and grey water, there is very little waste and the grounds are lush, green and beautiful. In my vlog I speak a little bit about how Nelson Mandela, physically, helped plant a bunch of trees in the park, you get to see some of the art in the city that was crafted right there, especially for Steyn City. There is a little something for everyone, of all ages, and you don’t even have to leave your ‘backyard’ or use your car to enjoy pristine living and recreation. Also minimising on pollution. Do yourself a favor and check out the virtual tour on their website. It does not compare to being there, but I have honestly never seen anything like Steyn City. It is so ‘clean’, pristine and simply… a better way of living. Any lifestyle that minimises waste and pollution is especially great for the environment. With my goal of being more active on YouTube, I uploaded a video on my YouTube Channel that I hope you will enjoy, I didn’t want to make the video even longer by talking about the detail of each of these items, so here is a blog post to provide those deets. Below are the ten items that I really loved this Festive Season. In the video you will get to know a little bit more about why these are my favourite items, where to use them and just why they are special to me. I also added a bunch of links to you can get them for yourself. Please comment below, which are your favourites and if you have any of them, please share with me why you love yours as much as I do. I don’t know about you, but I am not a very light packer and to keep myself from going overboard, stressing to get my bags weighed at the airport, this little device saves my life!!! Easy to carry with you everywhere you go and super easy to use. You can buy your own here. If you’re like me, and a little bit OCD, especially when packing for a trip, these Case Tidy bags are going to change the way you pack. I think I go on a little rant about how great these are, in my video, so please check it out. You can buy yours here. I don’t think I’ve ever though I needed one of these, until I received one! It is so good for not only storing, but travel with this. Great for undies and even swimwear. Buy your very own one here. Thank you to Cala from Shayla’s Goodies for making me this really special gift. Personalised gifts are probably one of my top gifts to receive. The fact that somebody went out to create something that is exclusive and meaningful to you, is the best feeling ever! I was sold by the mug but this just made my day! I am a sucker for cute little wooden boxes and apart from the awesome storage they provide, you can always find a purpose for them. At first I thought the world is a little crazy to make these, but it helps you practice mindlessness more than you could ever imagine. The fact that all you think about is actually colouring in, is so calming and healing to your body and mind. I simply love the intricate designs and patterns. I bought a very cool set for R199 here. 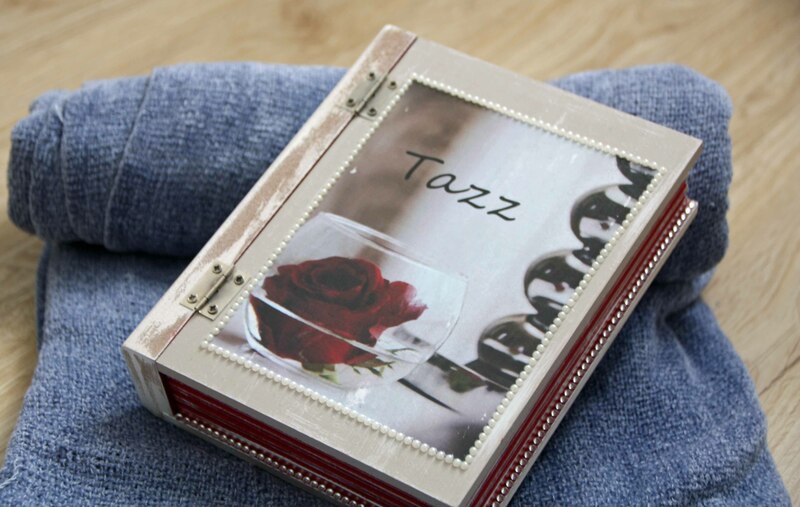 These go perfectly with the Adult Colour Books because they simply glide on in beautiful rich tones. There is a great set to purchase online as well, here. I received this awesome Bluetooth speaker at a Disney Africa event, and being a music lover, I am able to take my music with me Everywhere! From outdoor painting and picnics with my family to meditating or doing yoga in the garden. This speaker works so well! Buy yours here. That brings us to the end of my blog post, please watch my video here. Being on holiday is always great, but being able to go on holiday with your family and loved ones, is just about the best thing, ever! At the end of December my family and I planned a little trip spreading over the new year. Getaways that are a couple hours away is always good and it’s like you’re close enough to home to not get that homesick feeling. We went for eight incredible days and having the people I care about the most right there with me, we didn’t need much else. I don’t know if any of you have ever traveled to Waterberg but it’s a 3,5 hour drive out of Johannesburg. The drive was so nice and the views were pretty beautiful. But there is an 11km dirt road that is absolute death! My car and my stomach was not happy at all. So definitely travel with a 4×4 if you ever plan to go there! Once we got there the people welcomed us and gave us a little festive gift (box filled with chocolate) and I have to say, it kinda made up for the dirt road we just hit. Once we got there, we checked into our chalet and we chose our rooms, had a bite to eat and then off we went, exploring. They have really surreal views and the perfect peacefulness to unwind and relax. 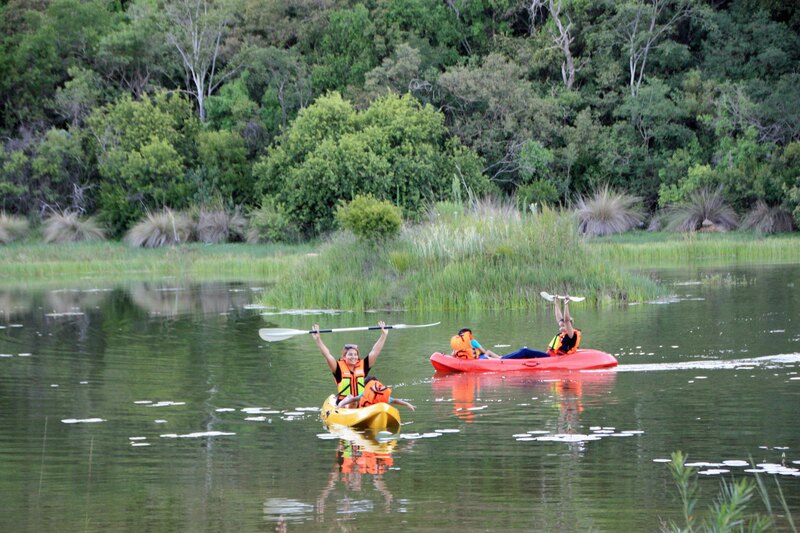 There is a lake where you can go kayaking, an incredible hiking trail and jam-packed play areas for the kids. From a GINORMOUS Jumping pillow (something I’ve never seen before this), tennis court, miniature golf, trampolines and of course, an incredible water slide at the pool. One of the things I thought was kinda a love-hate thing was the fact that we couldn’t really pick up signal, only at the bar, main gate and entertainment areas. It somewhat forces everyone to really bond, relax and experience LIFE. I know that seems a tad dramatic but it really felt like not having a tie to my technology was like being free and actually noticing so much not having to stare down at a phone as often as usual. No work, no social media, just play! We spend Quality Family Time. Here are some of the pictures we took over the period we were there, surprisingly enough, I didn’t end up taking too many. I did however try to vlog when I remembered. I really struggle with keeping up, especially when I’m with my family. I will hopefully up my vlogging and editing game soon. I would like to upgrade my equipment and my software because I know they could be so much better! I hope that you will enjoy ‘going with me on holiday’ and that you will comment, like and Subscribe to my channel. I’ve been uploading every Wednesday so hopefully I will improve with every video! Please comment below, telling me about your festive season and what you got up to for New Years Eve. Thank you for reading and thank you to everyone who is consistently supporting me. Happy 2018! Hope you will all have a blessed and spectacular Year ahead!! When I think of summer, I think of Mocktails at the pool, unicorn pool floats, great music and some really good company. Ramkiki is a such a great venue hidden in Honeydew. Just a few kilometres after Clearwater Mall. I remember looking for wedding venues with a friend a couple years ago and this venue has not only upgraded but they’ve opened the venue up to so many more possibilities for business. Whether you’re looking for a venue for a quick meeting, chilling at the pool, looking to book a conference or host your entire wedding, and pre-celebratory events or to book a quick little getaway, Ramkiki can host it all. They have several rooms, a restaurant and a beautiful pool area, what more can you ask for? 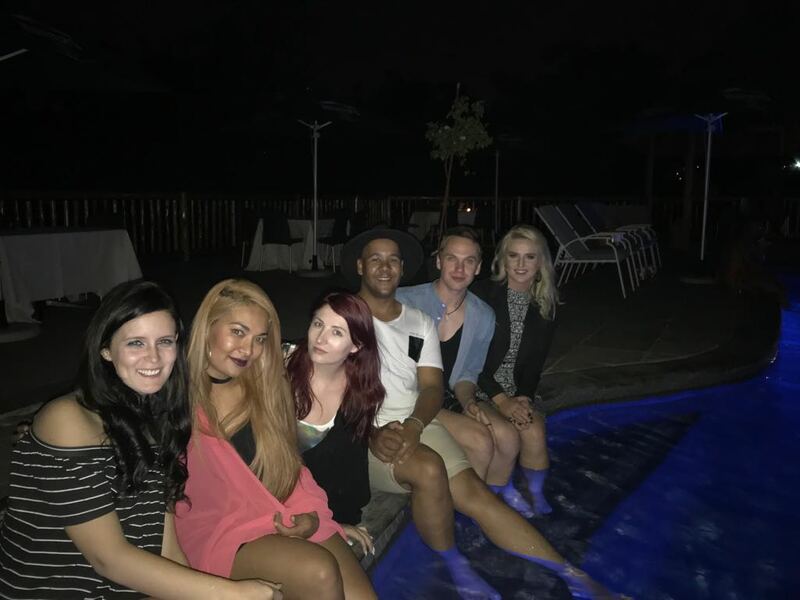 The pool party had such a great vibe and it was like being on holiday, on a Thursday. It is far enough from the city to escape that hustling city life but close enough so you know you need to head back to reality after a relaxing day. They were kind enough to gift us all with vouchers, so I’m definitely heading back there very soon, to redeem it. The one thing I’m just not sure about, is what I will be splurging my gift card on, whether I would like to go to the restaurant and eat myself into a food coma, whether I would like to book a room and enjoy the resort, or whether I would like to use one of their incredible venues for a Bonafide event. So many options!